Glycogen accumulation causes progressive muscle weakness which worsens as more glycogen is accumulated over time. Pompe disease is also known as: Acid Maltase Deficiency, Glycogen Storage Disease Type II, Glycogenosis Type II, Acid alpha-Glucosidase Deficiency and Lysosomal alpha-Glucosidase Deficiency. This accumulation of Glycogen occurs in the Lysosome. Pompe disease is a continuum of disease spectrum. At one extreme is the infantile presentation where babies are extremely hypo-tonic, have significant cardiomyopathy and typically die within the first year of life without any intervening therapy. The cause of death is usually cardiorespiratory failure. It is a lethal disease. For patients who have the later onset forms of Pompe disease, survival is increased, but there is still significant morbidity and early mortality even with adults with Pompe disease. What are the symptoms of Pompe Disease? What are the symptoms in Infantile onset? When infants are affected by the disease, signs and symptoms usually appear within the first few months of life, sometimes even immediately after birth. 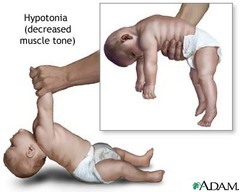 Parents may initially notice the babys general muscle weakness and difficulty breathing and/or eating. For severely underweight infants, tube feeding may be used to provide liquid food directly to the digestive system. Heart rhythm changes, caused by weakened heart muscle that cannot function properly. Infants with Pompe disease eventually need to use a ventilator, a special machine that helps them breathe when they can no longer do so on their own. How does a normal Lysosome work? How does the Lysosome of someone affected with Pompe function? Is there treatment for Pompe and how does it work? Continuous Enzyme replacement therapy using a drug called Myozyme is the only form of available treatment available worldwide. Before Myozyme was available, supportive care until death was the only option available to the patient. Now, with ERT, the situation is very different. Other therapies such as Gross Motor Physio, Occupational Therapy as well as Speech and Feeding therapy area also vital to Pompe patients. Below is a link to a video showing Juans progress on treatment. How often is ERT given and how is it given? Myozyme is given via an IV infusion once every 2 weeks. The infusion takes about 6 hours in total. Children and adults generally have a device called a porto-cath inserted under the skin which feeds into a main vein in the body. This reduces the hassle of needing to find a suitable vein for every infusion. What are the other treatments available? Physiotherapies such as Gross motor Physio, occupational therapy and speech therapy are vital in maintaining brain and muscle function. Specific diets whereby certain foods are avoided are also beneficial in long term treatment. What are the treatment cost and cover? Treatment is dependent of the dosage, weight, age and severity of the disease. Treatment can cost between R28000 to R350 000 per month. Pompe disease falls under Prescribed Minimum benefits and medical aids are therefore obliged to pay for all the costs in full from a separated fund that does not affect your savings. Hirschhorn, Rochelle and Arnold J. J. Reuser. Glycogen Storage Disease Type II: Acid Alpha-glucosidase (Acid Maltase) Deficiency. In: Scriver C, Beaudet A, Sly W, Valle D, editors. The Metabolic and Molecular Bases of Inherited Disease. 8th Edition. New York: McGraw-Hill, 2001. 3389-3420. Slonim AE, Bulone L, Ritz S et al. Identification of two subtypes of infantile acid maltase deficiency. J Pediatr 2000 Aug;137(2):283-5. Kishnani PS, Hwu W-L, Mandel H, Nicolino M, Yong F, Corzo D. A retrospective, multinational, multicenter study on the natural history of infantile-onset Pompe disease. J Pediatr 2006 148:671-676. Van den Hout HMP. The natural course of infantile Pompes disease: 20 original cases compared with 133 cases from the literature. Pediatr 2003 Aug;112(2):332-340. Kishnani PS, Steiner RD, Bali D et al. Pompe disease diagnosis and management guideline. Genet Med 2006 8:267-88.